David was surrounded by men of valor who were committed to his mission. They were valiant men who risked everything for David, not yielding to fear or criticism or a desire to be popular. 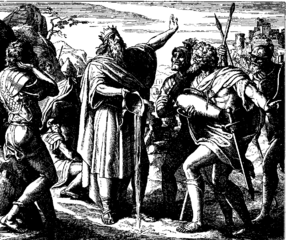 They were viewed by many in Israel to be a band of rebels when David was pursued by Saul and later by Absalom. These mighty men didn’t even yield to their own physical exhaustion, but they fought tirelessly for what they believed in, as did Eleazar whose hand was stuck to his sword. Yet, we see that hundreds of years later, another King came with a mission and had a following of committed men who carried out His work even after He left their midst. Their commitment eventually cost them everything, including their lives. Jesus disciples are an example to us and an illustration of a common theme in the Bible. God often uses a relatively small group of people who are willing to risk everything to accomplish His work. We must ask ourselves whether there is anything preventing us from following Christ and teaming up with others in this same way to accomplish our King’s work.